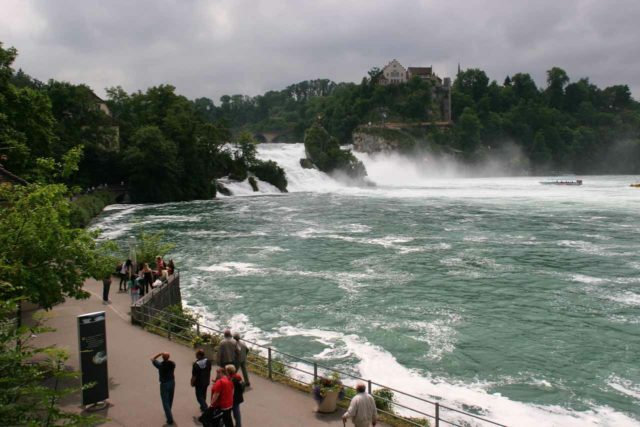 Rhine Falls (also Rheinfall in German; pronounced “RHAYN-fall”; I’ve also seen it spelled Rhein Falls) has been proclaimed to be Europe’s largest waterfall. 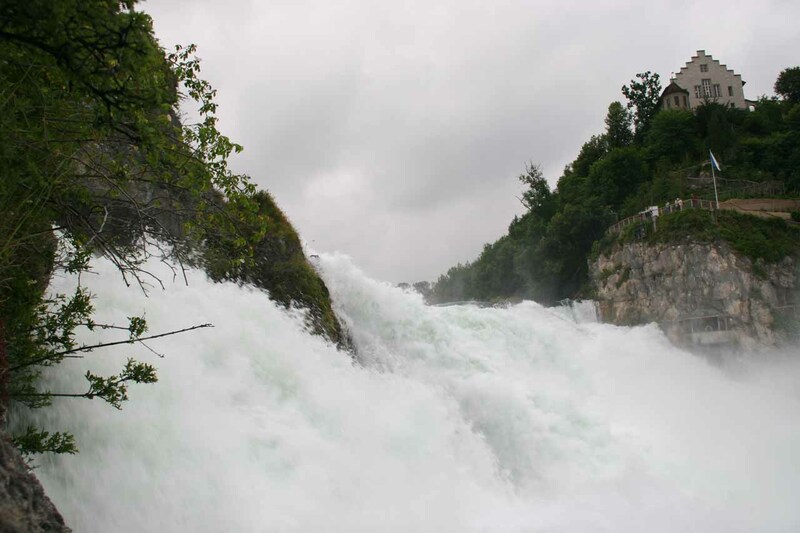 I’m not sure how true that claim is, especially if you count the waterfalls in Iceland, but it is pretty big and powerful nonetheless (though it’s definitely miniscule compared to Niagara Falls). 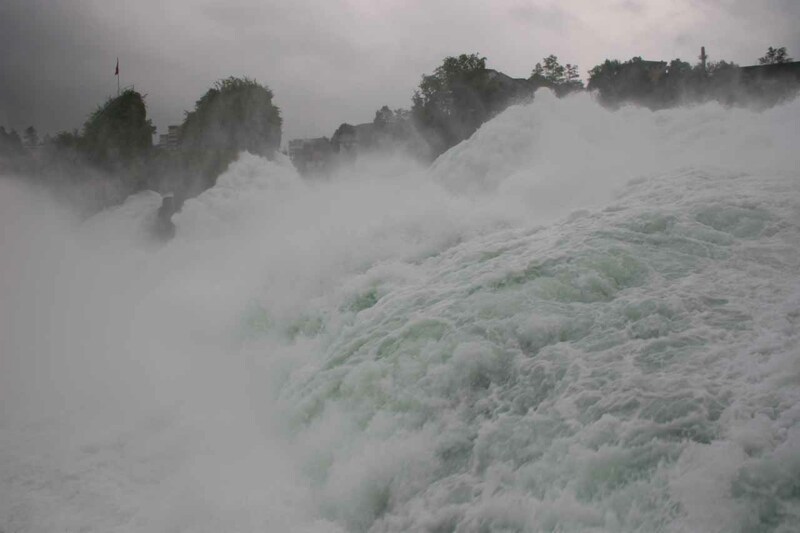 It’s said to have an average flow of about 700 cubic meters per second as the Rhine River (Rhein River?) 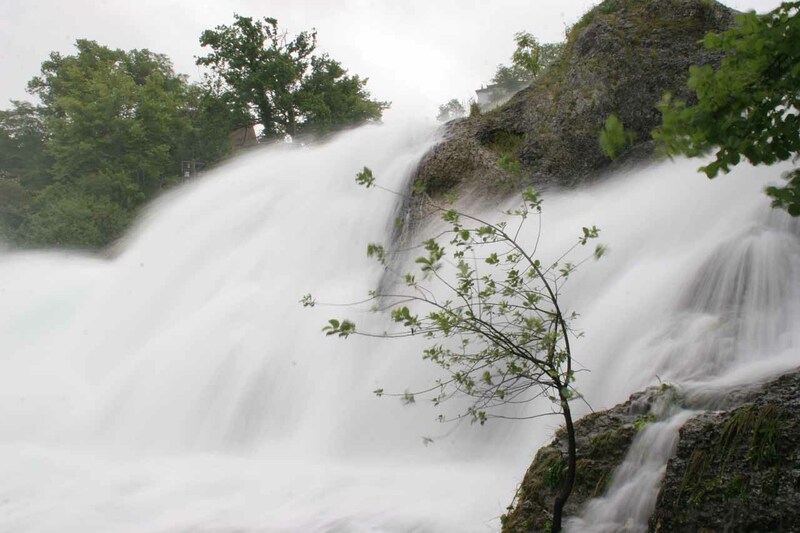 rushes over a sloping riverbed spanning 150m while dropping 23m in vertical height. We noticed there were islands and rocks that split up the waterfall into segments. One of the islands in the middle of the falls (which I’m going to call the “middle island” from now on) had a boat dock as well as stairs leading up to a tight lookout with railings to support visitation via boat tour. Julie and I also noticed a separate rock or island with a natural arch nearby the middle island. 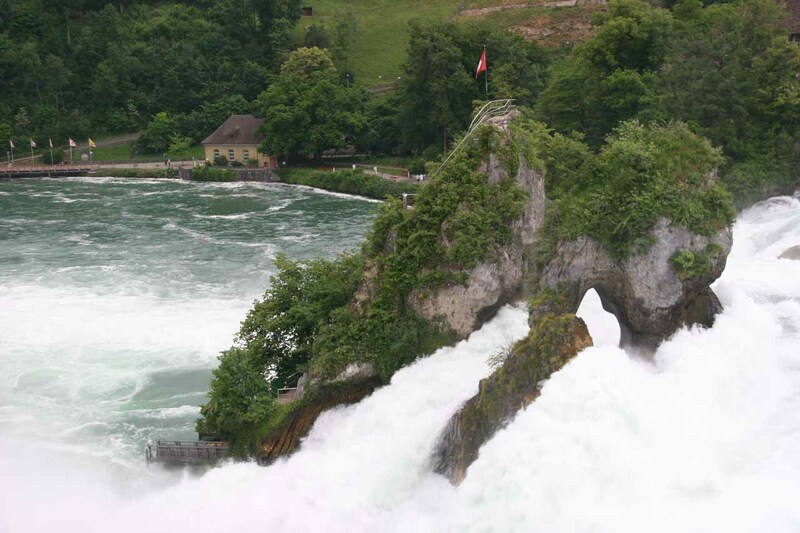 Although we were able to experience this waterfall from a variety of positions and angles, we’ve identified three distinct sections – Schloss Laufen, Middle Island, and Schlossli Worth or Schlosschen Worth. 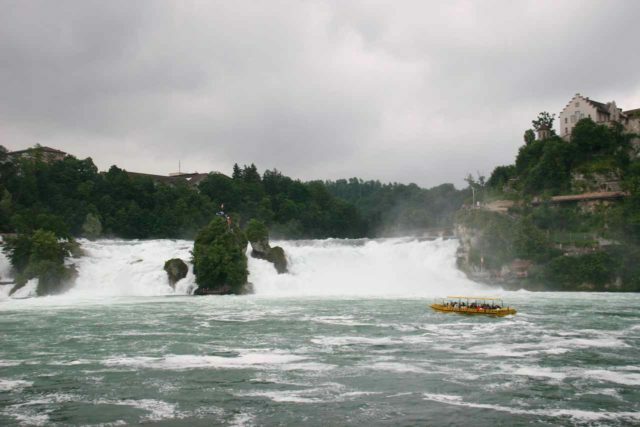 I’ve decided to describe each section (and its directions) separately so we can paint a clearer picture for you about the experience and the logistics of a visit to Rhine Falls. 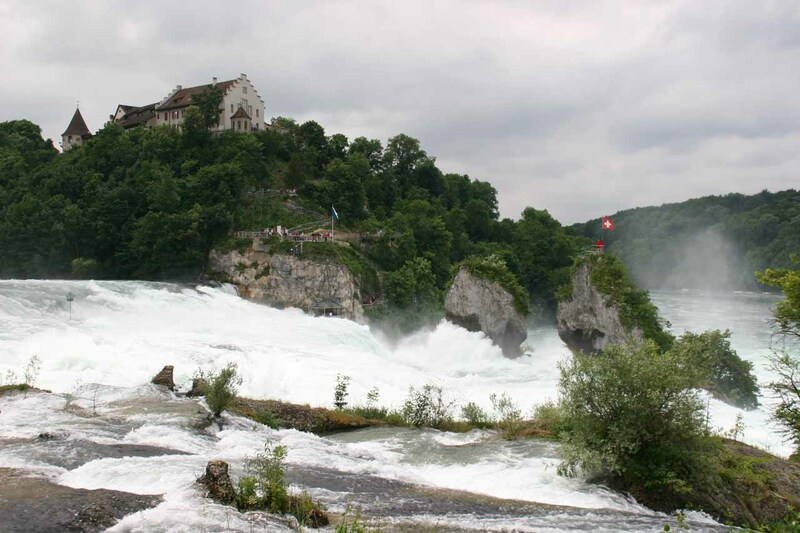 Schloss Laufen was that castle perched above and adjacent to Rhine Falls (i.e. the castle you see in the photo at the top of this page). 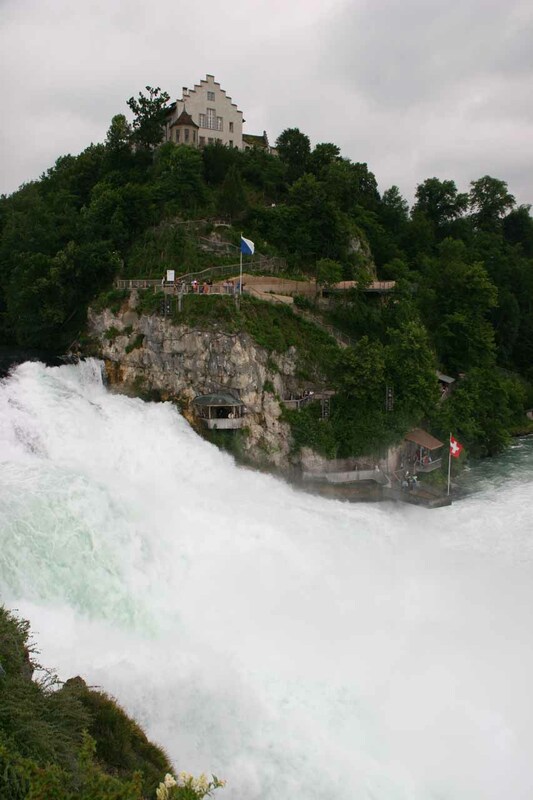 This castle provided the closest and most intimate views of the waterfall as there were numerous overlooks providing both top down views as well as riverside views of the mass of turbulence before us. 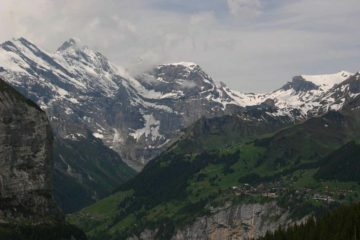 Although this side required paid admission (I recalled it was 5 Swiss Francs per person as of our 2010 visit), it definitely had the more interesting viewpoints. 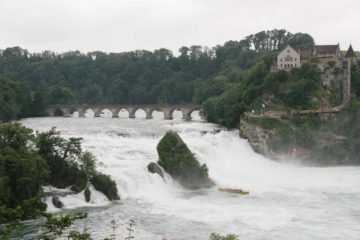 For example, we managed to get satisfying views of that natural arch since it was closer to this side of the river. 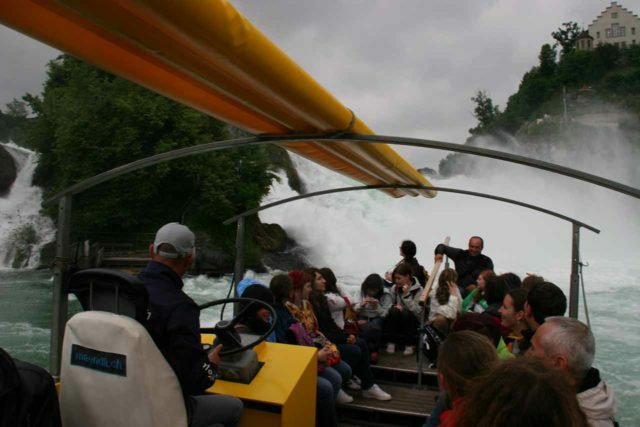 We were also able to stand on a platform that protruded from the riverbank out over the turbulence itself! There were even a couple of viewing platforms that were so close to the waterfall that it seemed like we could touch it (though in reality we couldn’t and we probably shouldn’t even if we could)! 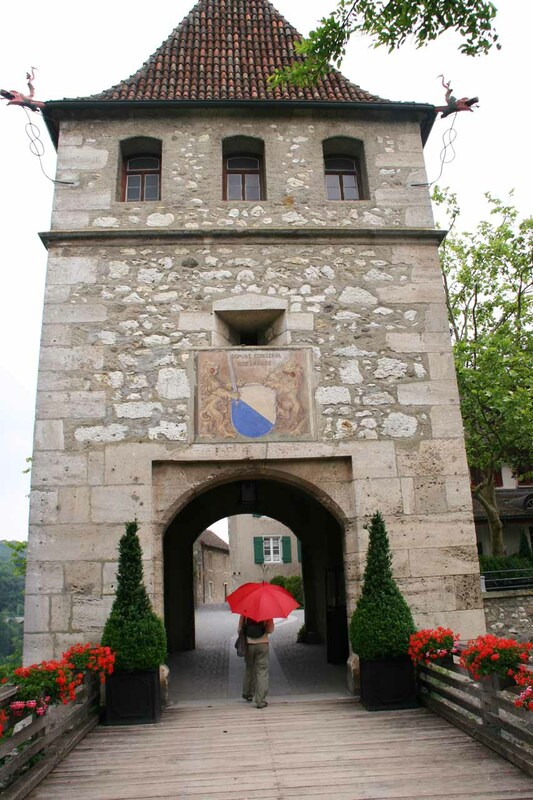 As for logistics, we happened to take bus #634 (I think) from Schaffhausen to Schloss Laufen directly. We didn’t know if that was the most efficient bus to take since it took us 26 minutes to get there as it pretty much stopped at every conceivable bus stop en route. In any case, this was one option and I’m pretty sure there must’ve been faster and more direct buses from the train station to Schloss Laufen. 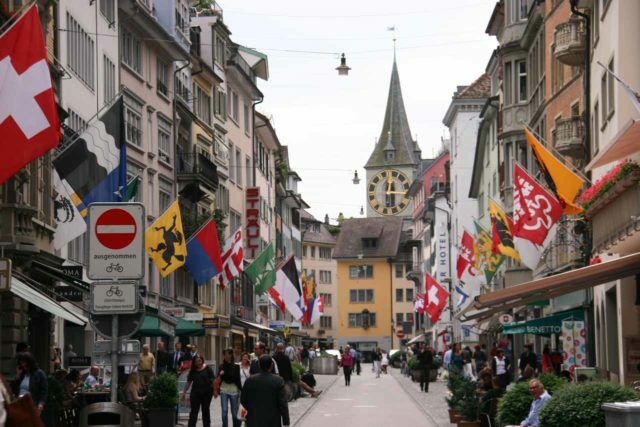 The bus we took was covered in our Swiss Rail Pass. Once we were at the castle and paid our admission, we then went through parts of the castle’s exterior before getting right onto the walkways and stairs that would stop at several vantage points as the path descended. 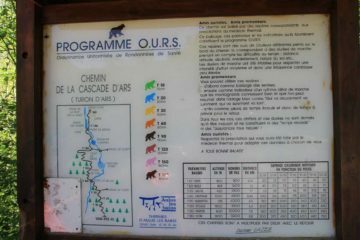 We ended up doing this walk only one-way (towards the banks of the river) since there was a boat dock at the bottom. 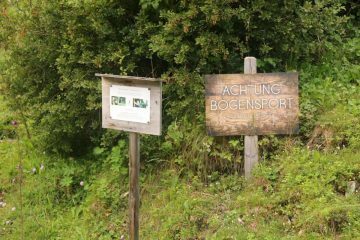 However, it was possible to forego the boat and head back up the walkway towards the Schloss Laufen entrance to leave this side. 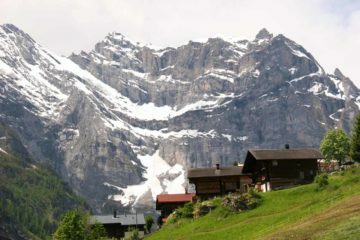 Initially since we were above the waterfall, the views were looking down towards the waterfall. 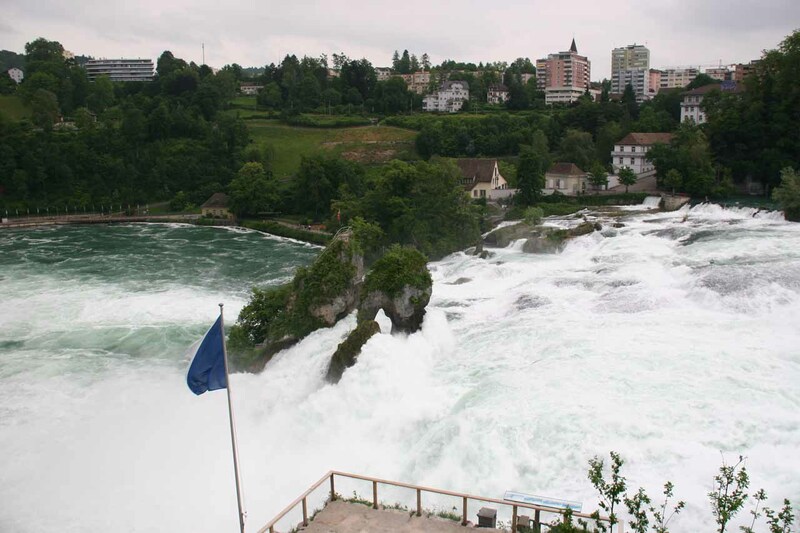 From these vantage points, we could look across the falls towards other buildings within the town of Neuhausen as well as appreciate some of the context of the falls. As we went lower on the walkway, we started paying attention to the intriguing natural arch within the waterfall as well as tourists who managed to set foot on the middle island. 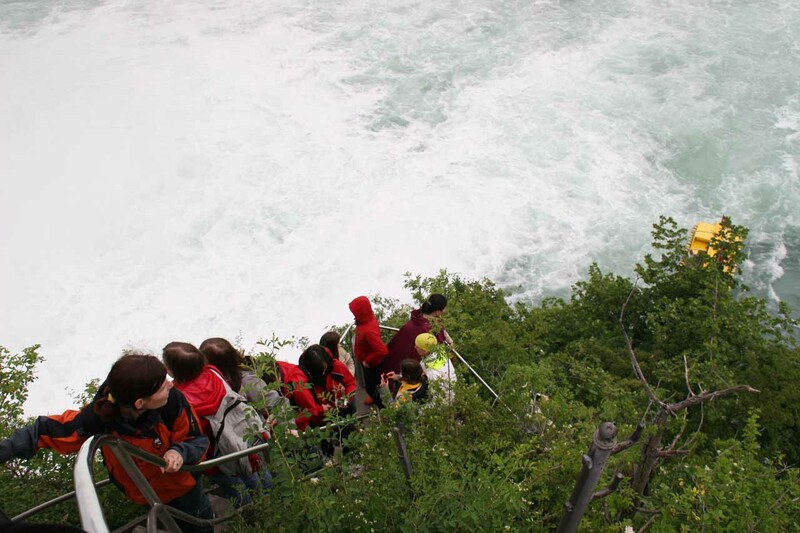 As we got to the bottommost sections of the walkway, that was when we experienced a viewing area that was literally right next to the edge of the waterfall as well as another platform that was protruding directly over the waterfall itself. By the time we had our fill of this side, we made it to the end of the walkway where there was a boat dock where we paid money to ride the boat that ultimately led us to the other side of the river. 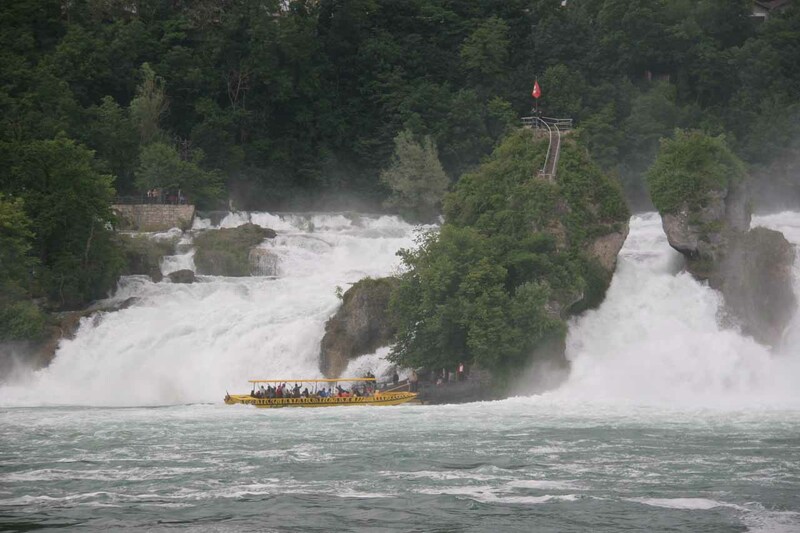 By the way, that boat also provided another way to reach Schloss Laufen had we come from the other side of the river. For directions on getting to the other side from the train station, see the Schlossli Worth section below. 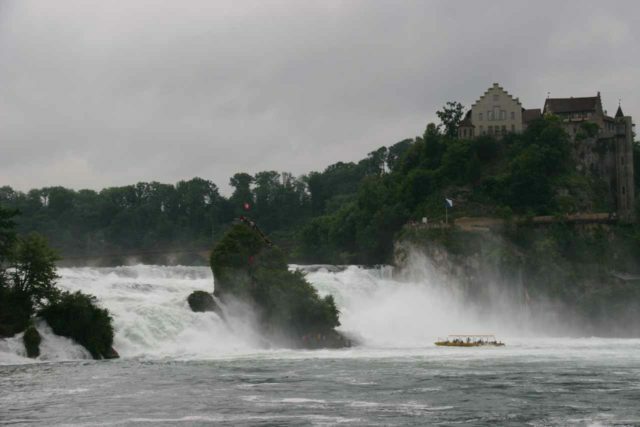 The Middle Island was what I was calling that island that sat right in the middle of Rhine Falls. 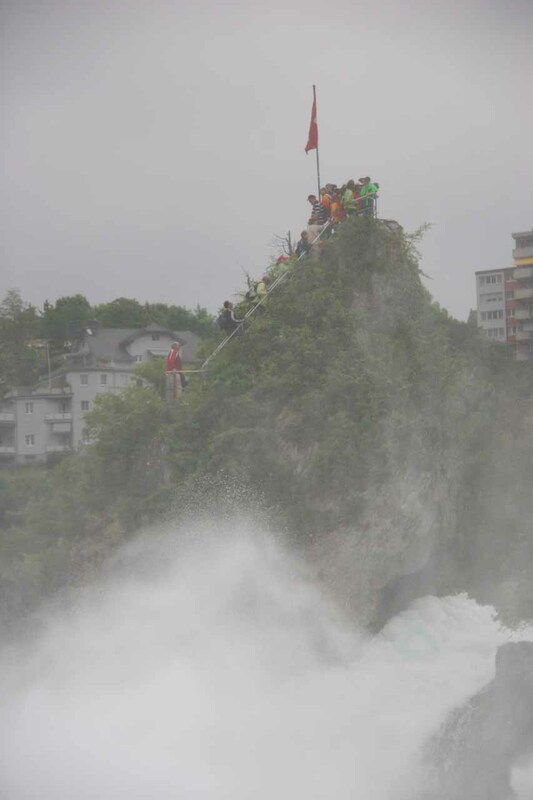 There was a boat dock as well as a stairway that went right to the top of the rocky island where there were some railings and a Swiss flag perched at the very top. And in order to visit it, we had to take a boat. I recalled that there were four options for taking the boat. I don’t remember exactly which option did what, but I do know that we took the one that went across the river as well as making a stop at the Middle Island. 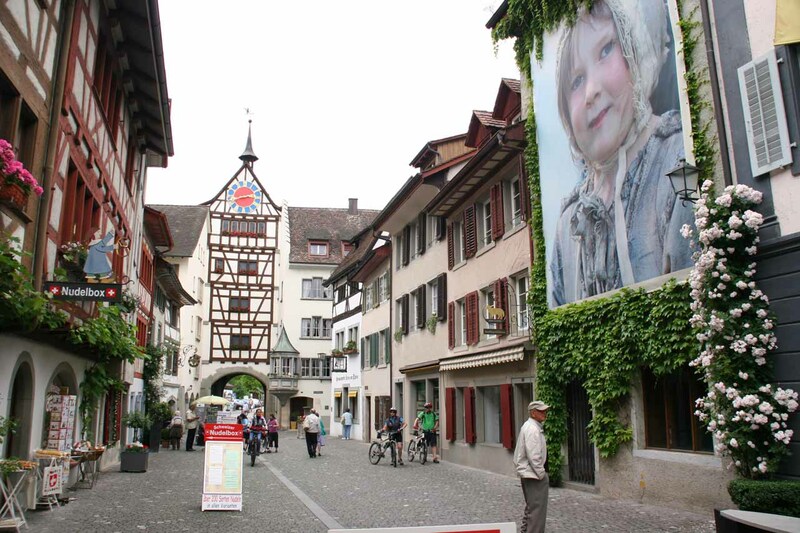 Other options included an all-inclusive longer boat ride within the Rhine combined with a stop at the Middle Island, an “audio tour” cruise on the Rhine without the stop in the Middle Island, and a simple shuttle to the other side of the river. 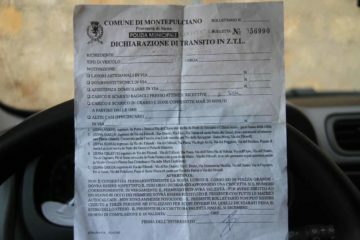 The boat ride costed extra, and how much depended on which option chosen. 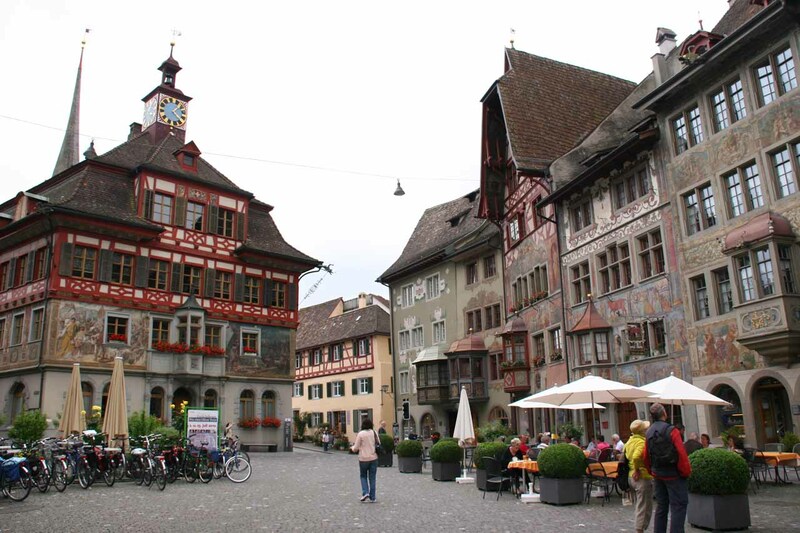 I think Julie and I paid 10 Swiss Francs per person for our Rhine River traverse combined with a stop at the Middle Island. Once the boat dropped us off at the dock on the Middle Island, we went up the stairs to the top. There was limited space up there so it definitely got pretty crowded (which was especially the case if multiple tour groups were dropped here at the same time). 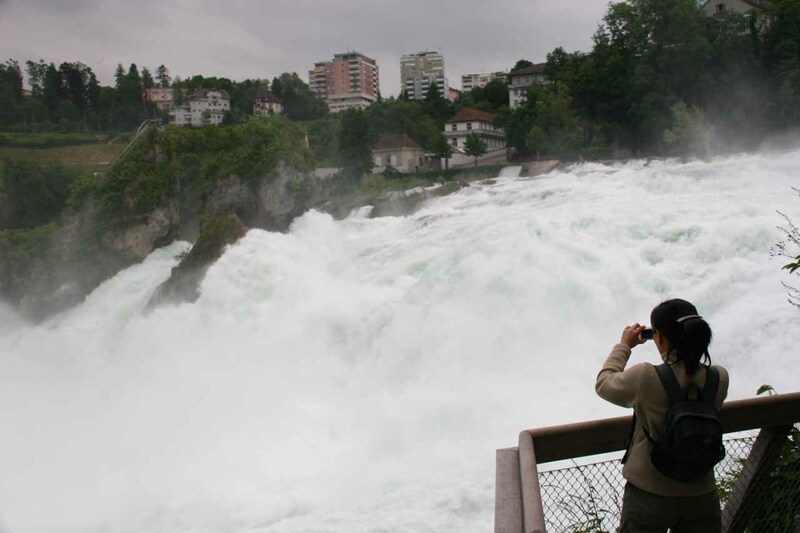 So there was an informal system of people queueing up on the stairs waiting their turn to take photos and experience the 360 degree views of being surrounded by Rhine Falls itself. This was the castle on the other side of the Rhine River. The castle was a bit more distant to the falls than the Schloss Laufen, but at least the views on this side of the river were free. 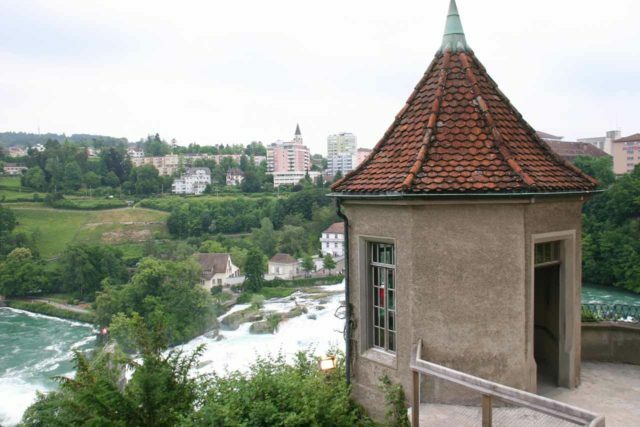 There was a cafe and restaurant at this “castle,” but there was also another similar cafe closer to the large viewing area by the waterfall’s massive plunge pool for a more direct view of the falls while eating. 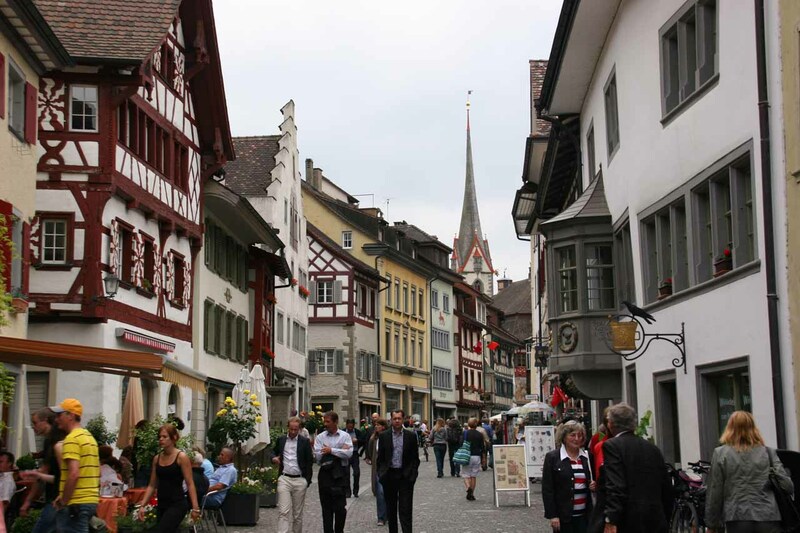 From Schaffhausen, we had the option of walking the 3km from the station to the town of Neuhausen (the closest town to the falls) or taking one of a handful of busses that frequently went back and forth between the towns. We noticed that buses #1 and #6 seemed to be the most suitable for this purpose as the transit time was less than 15 minutes when we went from Neuhausen back to the Schaffhausen Train Station. 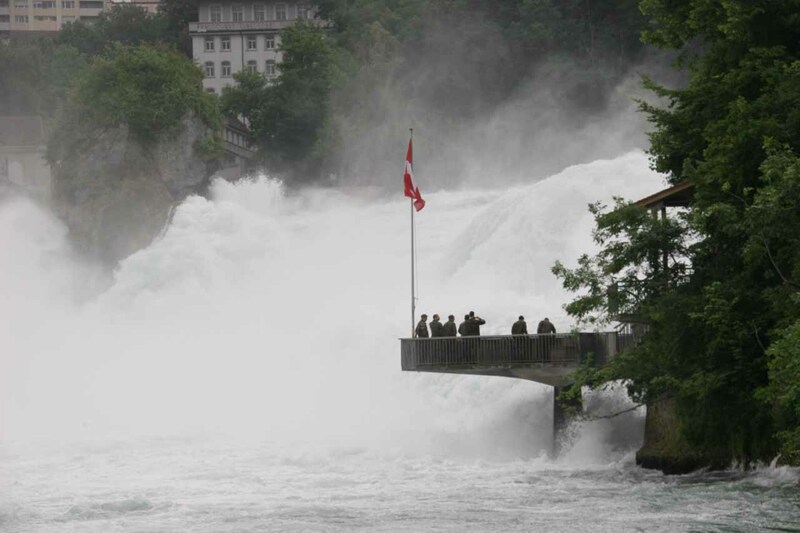 The buses were covered by our Swiss Rail Pass. A well-established walk all along the bank of the river from this castle to the edge of the falls yielded plenty of opportunities to photograph the falls. Given the extensiveness of this walkway, we were able to view the falls from almost every angle imaginable. There were a couple of junctions on the walkway that ascended towards higher vantage points. 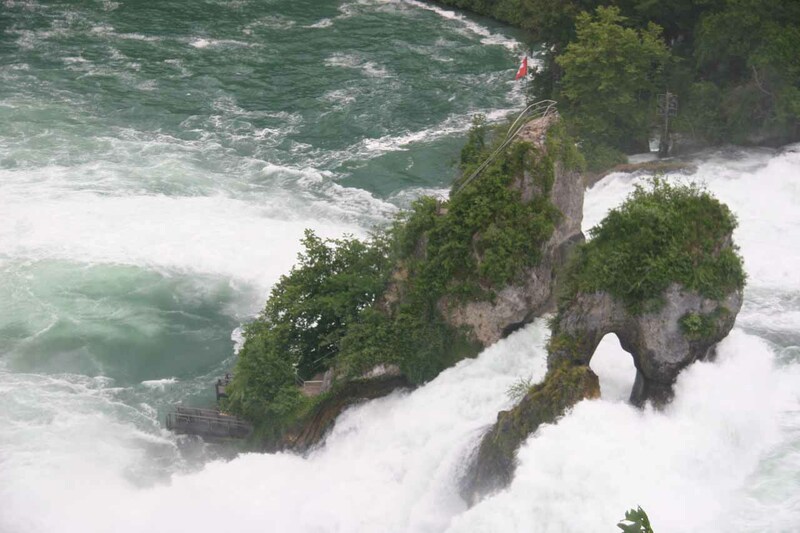 The ultimate reward for going up these “Upper Paths” was the view of the falls you see pictured at the top of this web page. 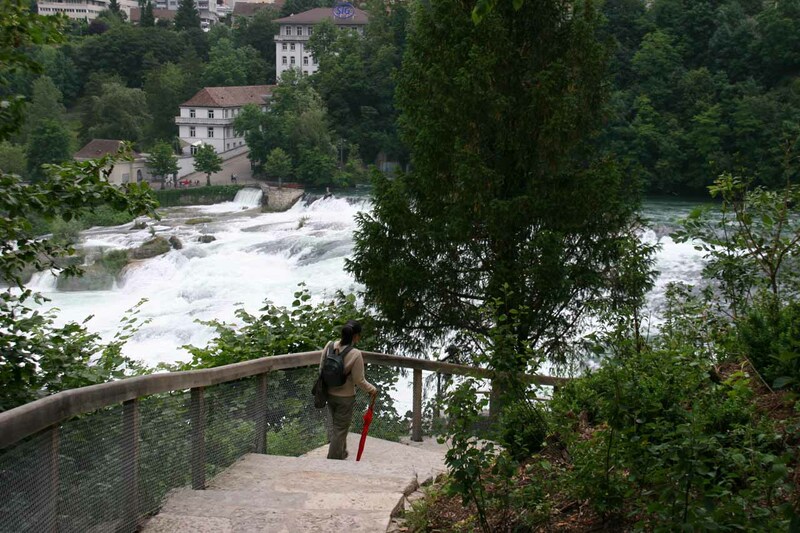 While we were checking out the falls from the “Upper Paths”, we did notice a bridge that was shared with a railway spanning the river above the waterfall thereby connecting Neuhausen and Schloss Laufen. I suppose it was possible to make the walk if spending money for the boat ride across the river wasn’t attractive. Back on the main lower walkway, there was a little exhibit where a cylinder of water resisted a propeller attached to a crank that we could manually turn. The point was that it was possible to measure how much energy we could manually generate since turning the crank would light up some bulbs indicating how much power was just generated. I recalled the bulb representing the maximum power that could be generated in this contraption indicated 80W. 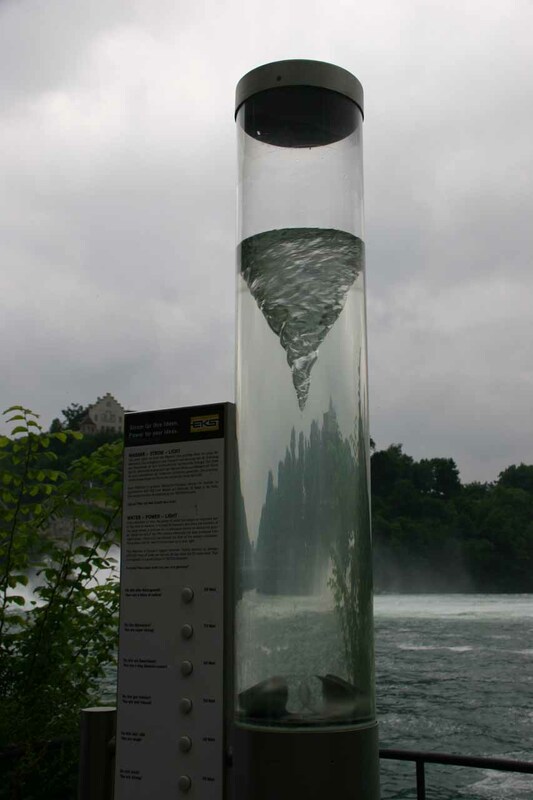 And while the crank was turned, it also generated a little vortex in the cylinder of water, where the more energy we put into turning the crank, the larger and longer lasting the vortex. 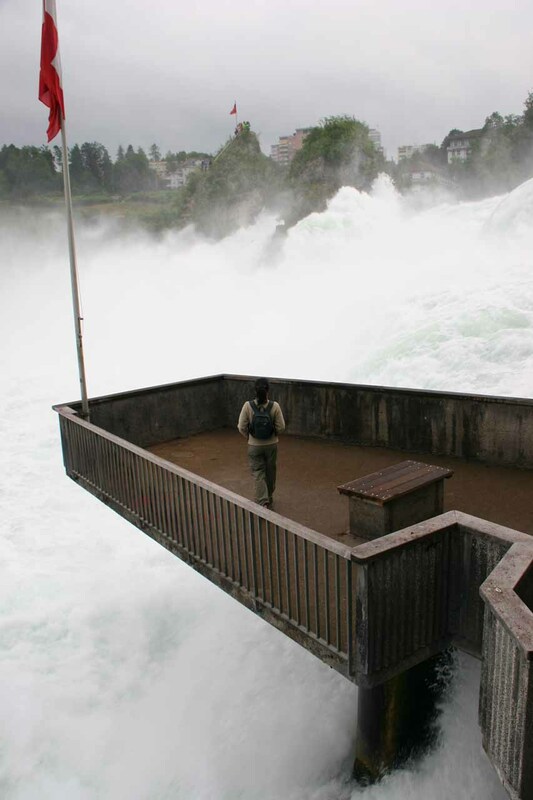 Finally, due to the stagnation of the plunge pool on this side of the Rhine, we noticed that some spots did tend to get a little smelly. That was probably an indication that the water might be polluted or at least harbor some microbes common in sewage. 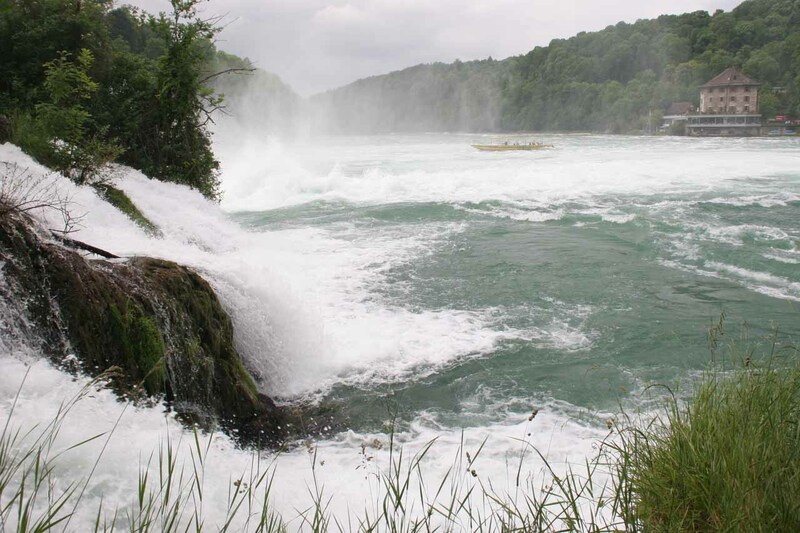 I’m sure that would at least keep any sane person from wanting to go for a swim for if the microbes wouldn’t get you, there would be the threat of hidden undertows and whirlpools from the turbulence of the falls that would also conspire to make swimming unsafe. 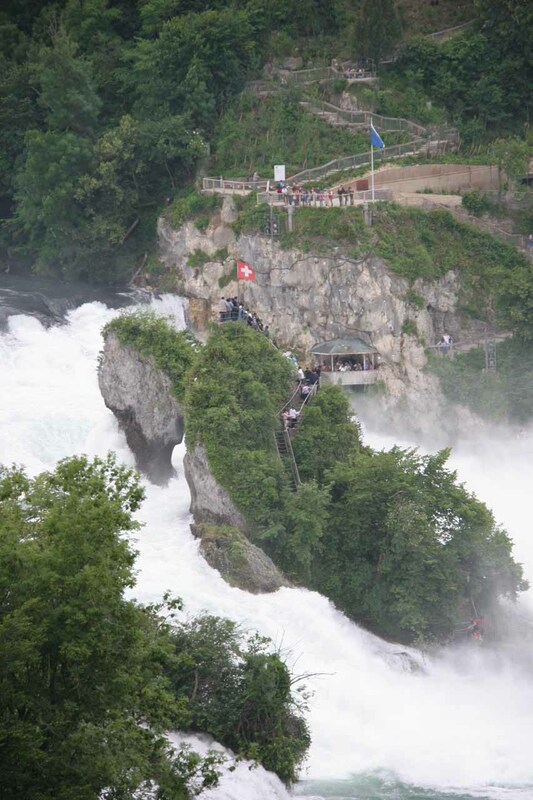 As the walkway eventually gave way to stairs at the edge of Rhine Falls (connecting to the Upper Paths), it also connected back to Neuhausen. As for getting to at least the town of Schaffhausen (the town with the rail connection nearest to the falls), this was how we managed to get there from Zürich. 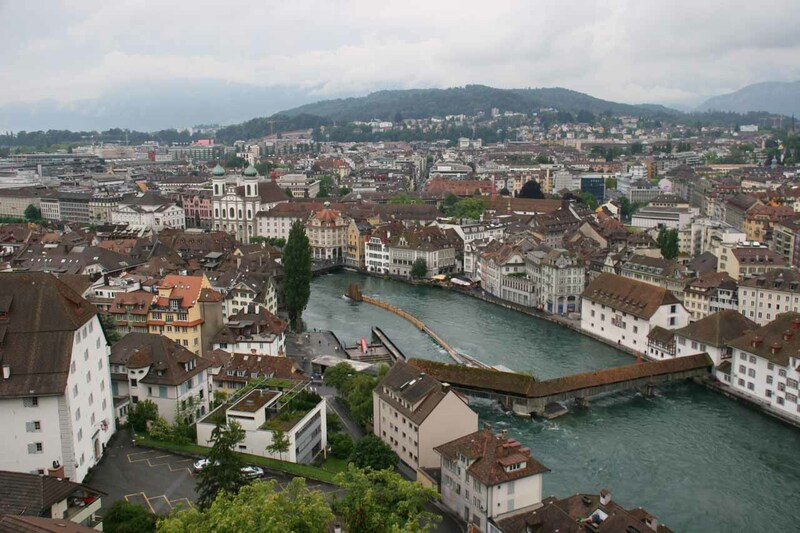 From the central rail station in Zürich, we took one of the fairly frequent trains (once every 15 or 30 minutes, I think) from Zürich to Schaffhausen. It took around an hour to get there with all the stops, but it took as little as 40 minutes on the return (when there were fewer stops). 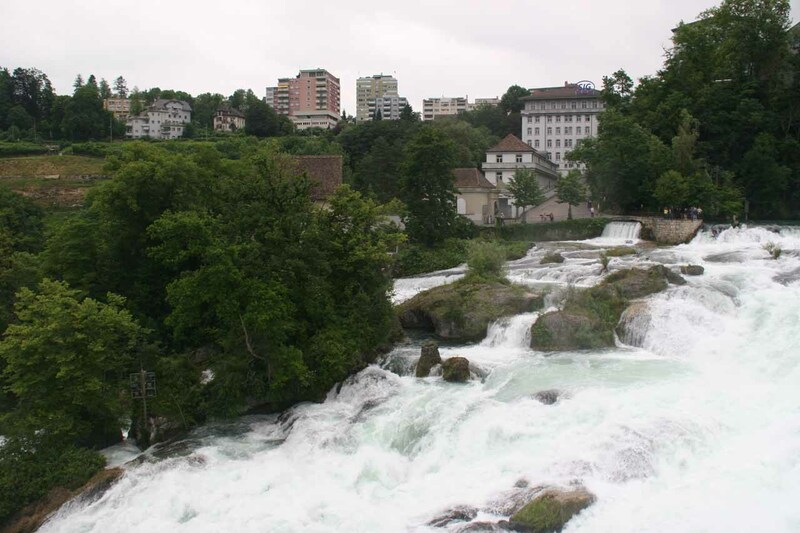 As the train got close to Schaffhausen, we peered out the window for a very brief glimpse of Rhine Falls out the right side of the train. Given the speed of the train and the fleeting opportunity to see the falls (especially with the blocking foliage), it was not feasible to photograph from the moving train unless we knew in advance when to start taking photos. Once we were at the rail station at Schaffhausen, there were options on how to continue onto at least the town of Neuhausen or Rhine Falls. These were described in detail for each of the options mentioned further up the page.